2011 Mission R. Picture credits - Mission. Submit more pictures. Introducing the Mission R, the new factory race bike from Mission Motors. 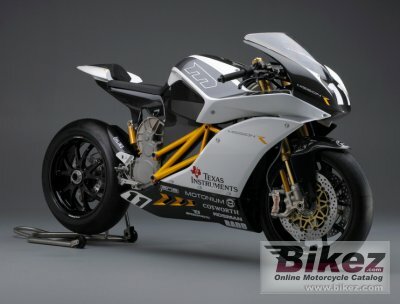 The Mission R is the most advanced electric racing motorcycle in the world. With components and software from MissionEVT, a revolutionary chassis design by James Parker, and cutting edge industrial design by Tim Prentice of Motonium Design, the Mission R is powerful, intelligent and downright fierce. Wheels: Marchesini forged magnesium 10-spoke. Comments: Battery Pack: High Energy Lithium-Ion of 14.4 kWh w/Integrated Thermal Management System. Ask questions Join the 11 Mission R discussion group or the general Mission discussion group. Bikez has discussion forums for every moped. View comments, questions and answers at the 2011 Mission R discussion group. You can sign up for e-mail notifications when other riders answer you. If you have extensive experience with the MC, please send us a review. If you consider buying this bike, you should view the list of related motorbikes Look at photos. Compare technical specs. And check out the rating of the moped's engine performance, reliability, repair costs, etc. You can compare the rating with other bikes.